The flows have dropped a little over the past 10 days, and the river is hit or miss- but we are talking about the new fork! 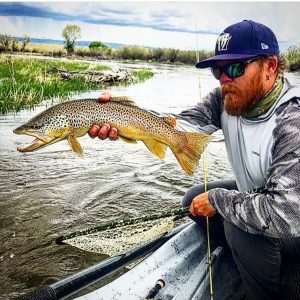 Dry fly fishing is still a good bet and some great fish are being caught on the river. Same story has the Green for bugs and action. This river is a great option for early season fishing. The fishing has been good under an indicator with scuds, sow bugs, worms, and hot bead nymphs. The stoneflies are around just enough to have a few fish looking up to them. The flows are way down but the water temps are way up! Get an early start and stop fishing if the temps get above 68 degrees. Look toward having some great fishing in early July down there. Soda Lake has been fishing well for limited times during the day. Some great sight fishing is to be had in the late morning hours and mid-afternoon. Cruising fish are everywhere. Try and get your fly 3-5 feet ahead of the fish and slowly give it some action. Scuds, damsels, or even a dry fly can do the trick right now. Our shop is getting custom-tied colored leech patterns in daily that are proven patterns on this lake. The fish are starting to move into the shallows with more consistency and sight fishing is a good option during the day. Hit the early morning hours and late evening when the fish are more active and streamers, buggers, leeches and mice have been working. Scuds and chrons are consistently working too. Stop in the shop so you can pick up some of our new lake patterns. Wading is difficult so be careful! Rapid water flows can change the water on a daily basis, so be safe! 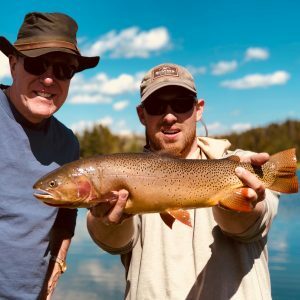 Summer is booking up fast, so don’t miss an opportunity to experience the best fishing Western Wyoming has to offer, with our expert guides. Book your fishing trip today! Green River: Flows at the Warren Bridge gauging station are 950 cfs. New Fork River: Flows at the Highway 351 gauging station are 750 cfs. Seedskadee: Flows at Fontenelle are 1300 cfs.